The children in Reception class have been very fortunate to have visits from a firefighter and a nurse this week, to support their ‘People who help us’ topic. Thank you to Mrs. North and Mr. Marshall for giving up your time to help the children with their learning. The children took part in a Remembrance Day service this week. They were very respectful during the 2 minutes’ silence and they shared art work, poems and prayers which commemorated those who have died in wars and conflicts. We raised over £190 for Children in Need today. 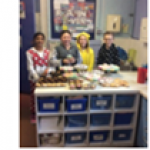 Thank you to everyone who dressed in their pyjamas and bought cakes. 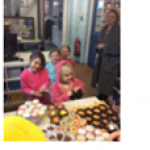 A special thank you goes to Scarlett Kedadi and Scarlett Clarke for organizing the event and making all the cakes to sell, and to Dhiya Chagger and William Smyth for selling the cakes with them. New parents may not be aware, but one of our members of staff needs to leave the car park at 2.40pm every day. If possible, please avoid entering the car park at that time so that the member of staff does not need to keep backing up. Thank you for your co-operation. Wednesday 18th and Thursday 19th, Broxhill Road will be closed between Noak Hill Road and Sunset Drive. Traffic will be diverted via Lower Bedfords Road and Orange Tree Hill. Due to the 3 way lights in operation, there will be some delays during these off peak hours. Thank you to Mrs. Hick for passing on this information. Reception- 94.29%; Class 1 and 2- 99.33%; Class 3 and 4- 97.59%; Class 5 and 6- 98%. Despite all the coughs and colds, we have managed to improve on last week’s attendance. Well done. Commendations this week went to Harry Newman, Bonny- Blu Kedadi, Kitty Higgins, Freddie Parrish, Mojola Awosan and Katie Percival. Well done to all of you ! The Class 5 and 6 Work of the Week certificates went to Dhiya Chagger and George Dignum for their excellent news reports ; Class 1 and 2 ceritficates were awarded to Poppy Whitcombe for fast, accurate and neat Maths work and Charlotte Woods for writing an amusing interview with ‘Mrs Armitage’ ; The Class 3 and 4 certificate went to Zachary Teshola for writing messages in Ancient Egyptian Heiroglyphics and Reception Class certificate was awarded to Kitty Higgins for writing a fantastic sentence about what she wants to be when she grows up. Well done to Neli Higgins, Kitty Higgins, Josh Thurbon, Finlay McKeown, Ruby Walton, William Smyth, Daniel Davies, Louise Stafford, Freddie French and Joe Stanley. They have all displayed excellent learning behaviour. Tuesday 8th December: ‘Cinderella’ Pantomime in school.